This article describes the "Shell Doc Object and Control Library" ("SHDocVw.dll"). The library contains the user interface (documents) portions of both Internet Explorer and the file system. 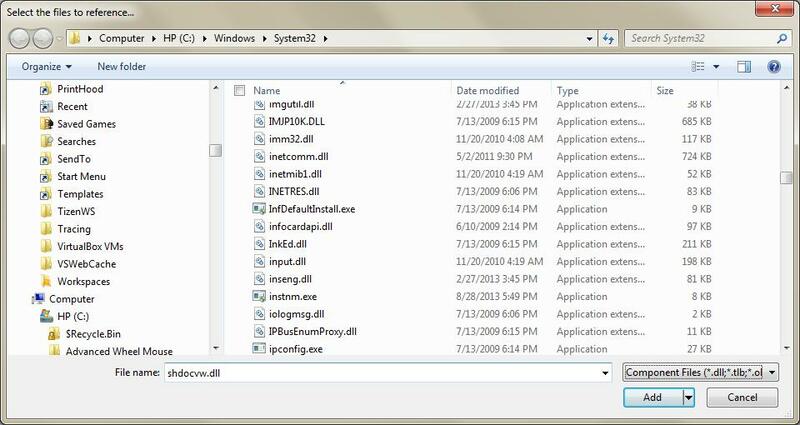 In this context, the file system is the Windows Explorer accessory that you use to look at Windows folders and files. The "SHDocVw.dll" library is a COM object, it is not managed. The executable file for Internet Explorer is IExplore.exe. It uses "SHDocVw.dll" which uses Mshtml.dll and other Active Document components. Mshtml.dll is the library for HTML. 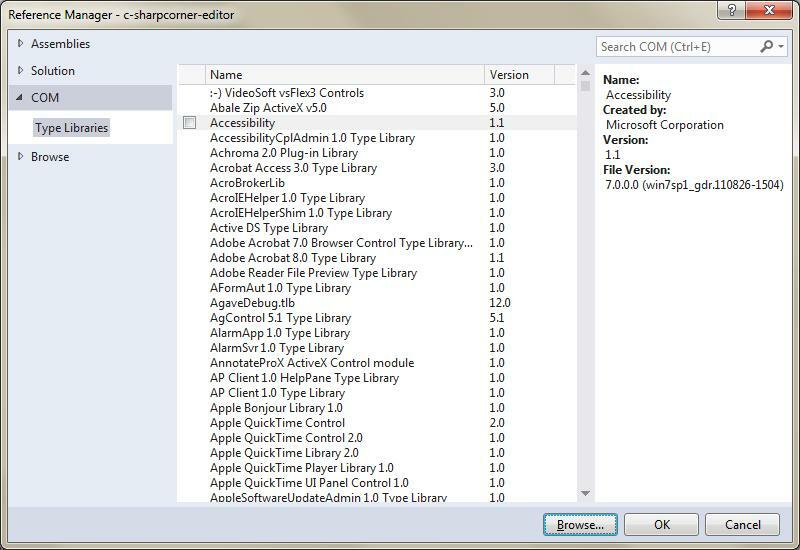 The "SHDocVw.dll" library is also known as the WebBrowser Control, however it is the COM (unmanaged) version. The .Net (managed) WebBrowser Control is a wrapper of the COM version. The open Internet Explorer browser windows can be enumerated using the ShellWindows member. The items in the collection are InternetExplorer objects. Most InternetExplorer objects are Internet Explorer browser windows but some InternetExplorer objects are "Windows Explorer" (the application for looking at files and folders) windows. Be sure to place a checkmark next to the library, then click on "OK". Note that if you have web sites in multiple tabs within an Internet Explorer window then each tab will be a separate InternetExplorer object. When enumerating or creating new browser windows this way, it is possible to control them, at least somewhat. We will explore what we can do in future articles.